My grandfather, Dr Gerhard Günzel, was born in Striegau (now Strzegom, Poland) in 1887. As he died in 1947, I have no first hand knowledge of him. All I know about his life before and during the Great War is from the memoirs my grandmother, Elise Günzel (née Zickermann) wrote down much later in her life. Her father held the post of first minister at the Luther Church in Breslau (now Wroclaw, Poland), while my grandfather's oldest brother was the second minister at the same church. Through this connection, by the time of the Great War, my grandparents knew each other fleetingly, but they were not yet engaged. "...In the meantime one declaration of war followed another and Germany saw itself surrounded by enemies. The brothers of my friends and many acquaintances were recruited or volunteered for the army. Amongst the latter was minister Günzel's brother "Beo" (Gerhard). After brief training he was sent to the front and a fortnight later news arrived that he had fallen at the battles around Ypres. Weeks later, however, he reported from English war captivity, from where he was only released to return home in September 1919." My grandfather was taken prisoner in 1914. I do not know where he was held before the opening of the camp on Jersey in 1915. 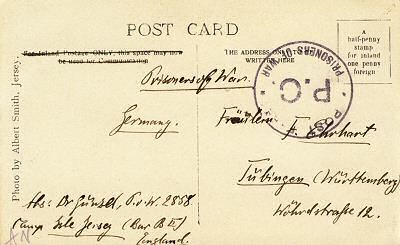 However, several postcards he sent to relatives show that he was taken to Jersey. Later he was moved to a camp at Brocton near Stafford from where he was finally released. 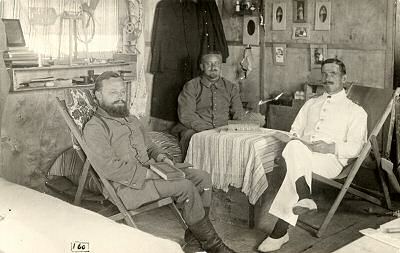 The three accompanying postcards were sent by my grandfather during the period of his captivity are photographs showing him in good health and, considering the circumstances, under quite comfortable conditions. The cards do not contain any messages except his name and address. The three postcards in my father's possession were originally addressed to a "Miss F. Ehrhart" in Tübingen, probably an unmarried sister of my grandfather's mother who was a born Ehrhart." In all three pictures, Dr Günzel has a book ready to hand. Fräulein Günzel says that her grandfather was a teacher and a PhD in History, and would have been probably quite content if he had been given books. In Postcards 1 and 2, it is clear that prisoners would try to make the best of their otherwise austere surroundings, which in any case, was to the same standard as the barracks for the large influx of recruits to the British Army. In the case of Dr Günzel and his companions, this included patterned curtains, bedspreads and tablecloth, along with deckchairs that doubled as easy chairs! Apart from sport, theatricals, reading and writing, prisoners would also spend their time at activities such as art and constructing models and other items. In Postcard 1, there are tools pictured in the lower right hand corner, while there is a model house on top of the table. During the summer, bathing parties would be taken onto St Ouen's Bay. More puzzling is the purpose of the device on the window ledge which looks like a weather vane. A close up of the fin shows that "JERSEY" and "1915" has been cut into it.